From G-BT08, Absolute Judgment, Fenrir’s Glimmer and Pir clones are revealed, as well as the details on Revelation, Genesis’ keyword! AUTO: GB1: [CB1] When this unit is called to R, if you have a vanguard with “Fenrir” in its card name, you may pay the cost. If you do, this unit gets Power +4000, and “AUTO R 1/Turn: [SB3] When this unit attacks, you may pay the cost. If you do, draw a card.” until end of turn. 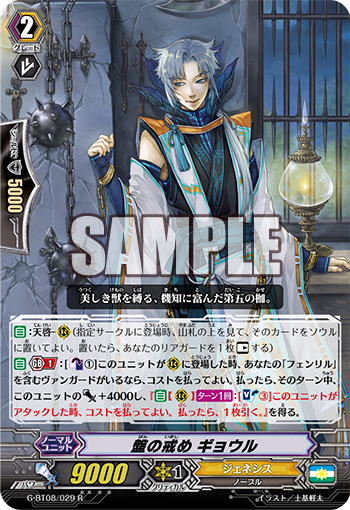 ACT [Soul]: [Put this card on the bottom of your deck] Choose 1 of your rear-guards, Stand it, and it gets Power +3000 until end of turn. If you have a vanguard with “Fenrir” in its card name, SC2, choose 1 of your units, and it gets Power +3000 until end of turn. Finally, 《Genesis》’ new clan ability has arrived! The ability of 《Genesis》 is 【Revelation】, which lets you see the future and create the future you desire！ By manipulating the Deck and the Soul, you’ll be able to seize victory! In short, this ability is more or less similar to the Deck manipulation of cards like “Battle Sister, Cocoa”. If the card you look at is a Trigger, you can return it to the top of the Deck, or if it’s a card like “Witch of Frogs, Melissa”, you can place it into the Soul via Soul Charge. When put into the Soul, since you need to Rest one of your Rearguards, you can use other abilties (such as Mellisa’s) to follow up. “Fetter of Boulders, Gjöll” not only has a 【Revelation】 that works when it appears as a Rearguard, but if your Vanguard is a “Fenrir” card, you can draw when it attacks. If you see don’t see that a Trigger is the card on top of your Deck via 【Revelation】, you can place it back on top of the Deck before you attack, then draw the card you placed on the top of the deck, you’ll be able to increase the chance of a Trigger Get. With this if you Rest an ally for 【Revelation】, you’ll be able to manipulate the future without reducing your own offensive capabilities. “Fetter of Chains, Gelgja” has an ability that lets it support 【Revelation】 while in the Soul. By placing it on the bottom of the Deck from the Soul, you can Stand one of your allies during the Main Phase and have that Unit gains 3000 Power! And if your Vanguard is a “Fenrir” card, you can performa an additional Power up along with a Soul Charge. You can stand an ally who was placed to Rest by 【Revelation】, making it easy to use 【Revelation】 while this card’s in the Soul! And when Gelgja appears as a Rearguard, you can use 【Revelation】, making this card worthwhile whether you Ride OR Call it. Today’s “Weekly Vanguard News Bits” will also be introducing new 《Genesis》! One of them is a new trump card who further evolves 【Revelation】 tactics, so be sure to check it out!